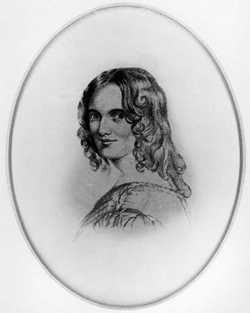 The English poet Sarah Adams (1805-1848) was surrounded by liberal writers. The men in her life were devoted to political activity and reform. She was the daughter of Benjamin Flower, the editor of a radical weekly paper, The Cambridge Intelligencer, who was imprisoned for six months by the House of Lords for criticizing a local bishop. Her pastor in London was William J. Fox, an English Unitarian, who, according to hymnologist Albert Bailey, “fought for larger rights of women [and the] freedom of the press,” finally leaving the ministry to take a seat in Parliament. Adams contributed both prose articles and poetry to Fox’s publication for church people, The Repository. She married William Adams in 1834. An inventor and engineer, he also wrote for political causes that were liberal in his day. He encouraged Sarah’s interest in theater and she appeared at Richmond Theater in London as Lady Macbeth. She received sufficient acclaim to be sought after for additional roles, but found she did not have the physical strength for the stage and gave up acting for writing. Sarah contributed 13 hymns to William Fox’s collection, Hymns and Anthems (1840-41), and revised others. “Nearer, My God, to Thee” appears in this collection. She also published The Flock at the Fountain (1845), a catechism with songs for children. Having cared for her sister who died in 1846 of tuberculosis, she succumbed to the same disease in 1848. In order to appreciate her most famous hymn, one must be familiar with Genesis 28:10-22, a narrative of Jacob’s experience at Bethel. While traveling, Jacob found a stone for a pillow one night and had a dream of angels ascending and descending a ladder. Following his dream he built an altar at Beth-El (God’s house) out of the stone on which he had slept and anointed it with oil. Stanzas two, three and four carry the bulk of the narrative in this five-stanza hymn. Adams’ unifying theme is to be nearer to God. If one sings all five stanzas, the singer will voice the phrase “Nearer, My God, to Thee” or “nearer to thee” 16 times! The hymn reflects a personal faith and relationship with God that was common in the 19th century. In the United States, the text is sung almost exclusively to the tune BETHANY (1859) by music educator and church musician Lowell Mason (1792-1872). The hymn is associated with two assassinated presidents. The hymn was played as President James Garfield’s body was interred in 1881. President William McKinley was said to have quoted the hymn just before his assassination in 1901; bands played it upon the announcement of his death.